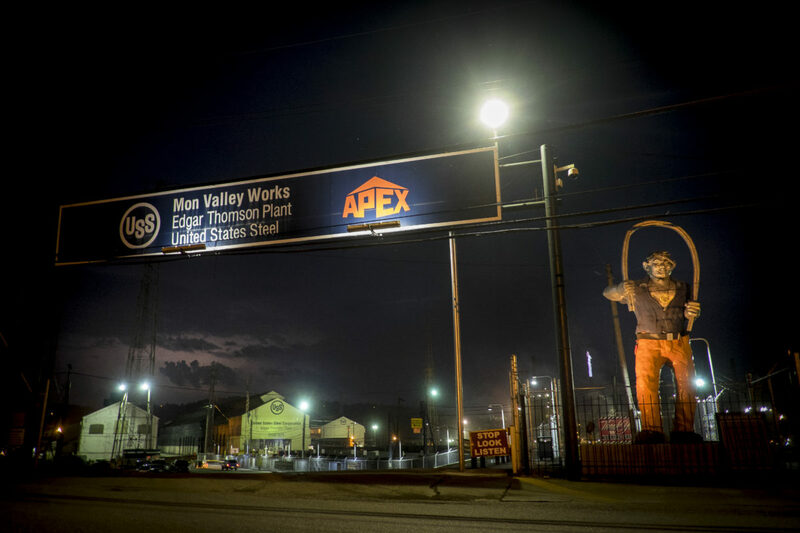 View of the Edgar Thomson Works from North Braddock, Pa. Active since 1872, the mill is currently owned by U.S. Steel and is part of the Mon Valley Works. The plant was Andrew Carnegie's first steel mill and was named after J. Edgar Thomson, who was the president of the Pennsylvania Railroad. 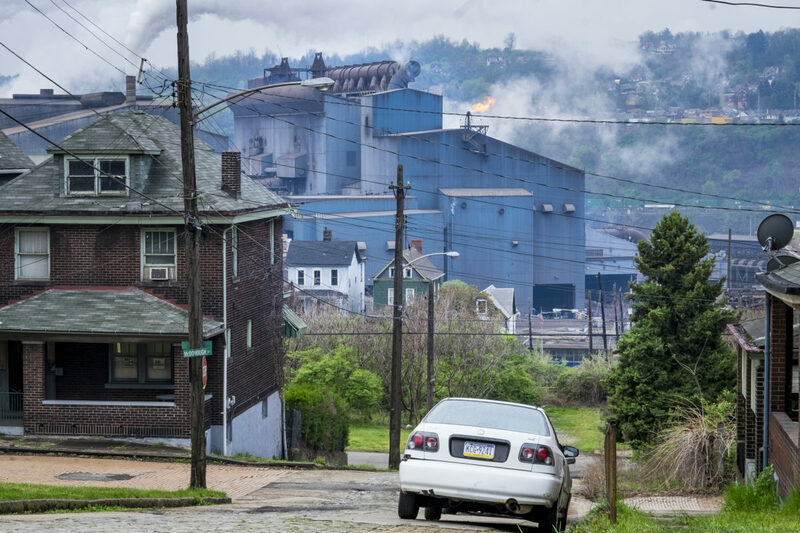 With a population of just over 2,000 (down from a high of 20,879 at the height of the steel industry, Braddock is almost a ghost town even though it is the home of the last steel mill still in operation in the Monongahela River valley. The Edgar Thompson Steel Works, built in 1872, was the first major steel mill built in the United States. Braddock was originally built to house the mill's workers, but none of the mill's nine hundred or so employees live there. The Edgar Thomson Steel Works is a steel mill in the Pittsburgh area community of North Braddock, Pennsylvania, United States. It has been active since 1872. The Edgar Thomson Works in Braddock, Pa. Active since 1872, the mill is currently owned by U.S. Steel and is part of the Mon Valley Works. The plant was Andrew Carnegie's first steel mill and was named after J. Edgar Thomson, who was the president of the Pennsylvania Railroad. 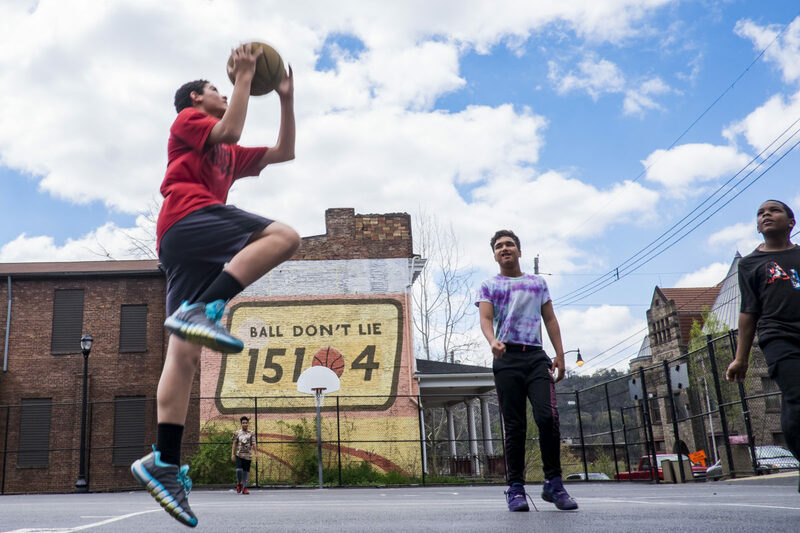 Braddock boys play basketball on one of two outdoor courts next to the community center built by Mayor John Fetterman since being elected mayor. The artwork on the building is also an initiative of Fetterman. His intention is for a pursuit of public art and he has implemented programs to attract artists to the area to live, work and inviting them decorate many of the old buildings. "Ball Don't Lie" comes from an expression in professional basketball attributed to Rasheed Wallace of the NY Knicks. If a player gets free throws for a questionable foul and then misses the shots, the Ball don't lie. The ball itself has judged the foul as bogus. 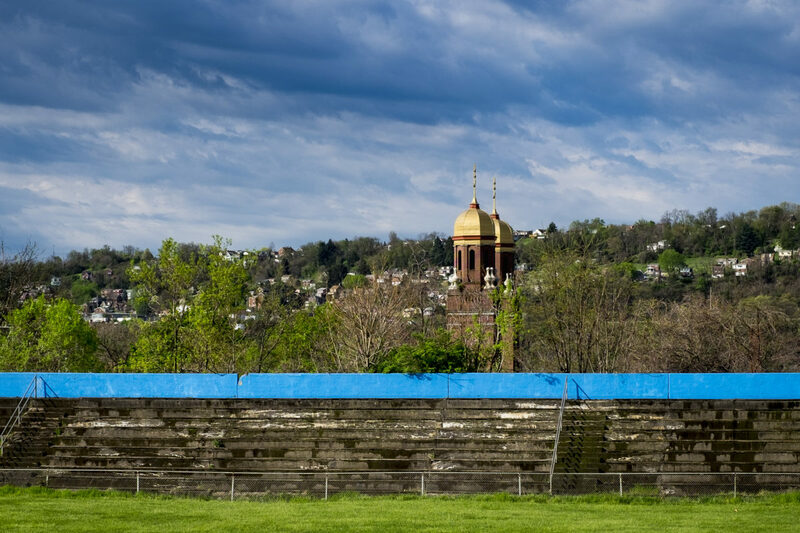 The twin spires of the St Peter & Paul Byzantine church in Braddock can be seen behind the football field of the now closed and demolished Scott High School in North Braddock. Gisele Fetterman carries her son August outside of the Free Store in Braddock, Pa. 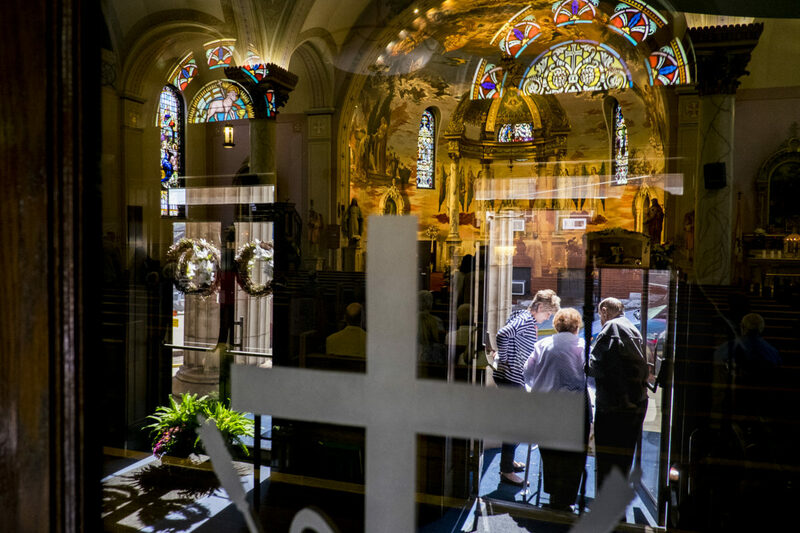 Opened in 2012 by Gisele Fetterman, wife of Braddock Mayor John Fetterman, and housed in a shipping container on donated property, the store collects overstock supplies such as clothing and food, and provides them to needy people in the community free of charge. 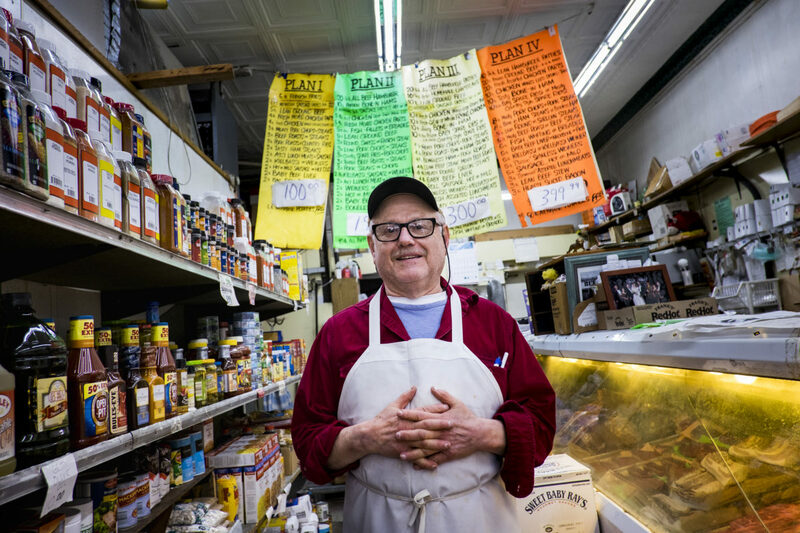 Bell's Market owner, Louis Greenwald, stands in his store in Braddock, Pa. After almost 50 years, the tiny shop purchased by Greenwald is still is open for business. It is just one of a handful of businesses still operating in Braddock. The store which began as a dirt floor store in the 1890s, is the town's only full-service grocery. 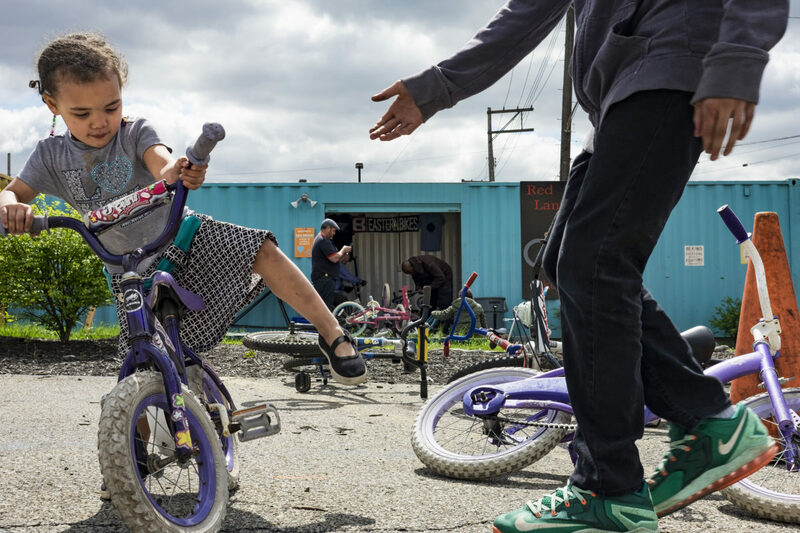 A young girl selects a bike at the Red Lantern Bike Shop in Braddock, Pa. Brian Sink opened the Red Lantern Bike Shop opened in 2012 with the idea to provide bike repairs and free bikes for residents of Braddock. But after it became popular they lifted the restrictions on residence. Sink said he gave away about 1,100 bikes last year. Sink, known around town as "The Bike Guy," fixes donated bicycles and gives them away for free at his shop that is housed in a shipping container and part of Gisele Fetterman's Free Store. 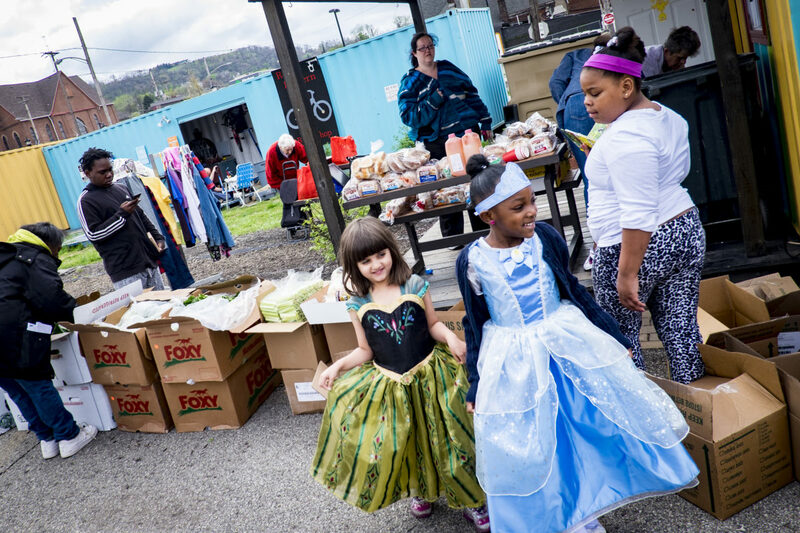 While locals shop at the Free Store in Braddock, Pa., two young girls wait to attend a princess tea party. 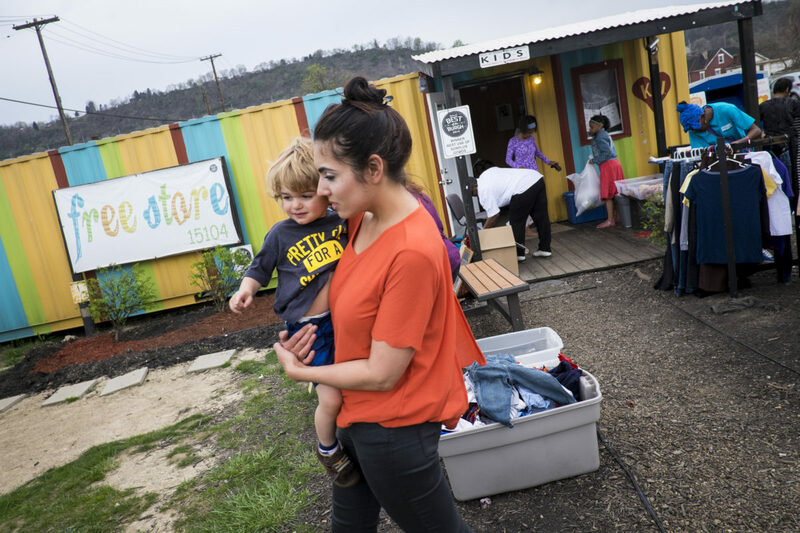 Opened in 2012 by Gisele Fetterman, wife of Braddock Mayor John Fetterman, and housed in a shipping container on donated property, the store collects overstock supplies such as clothing and food, and provides them to needy people in the community free of charge. View of the Edgar Thomson Works in Braddock, Pa. Active since 1872, the mill is currently owned by U.S. Steel and is part of the Mon Valley Works. 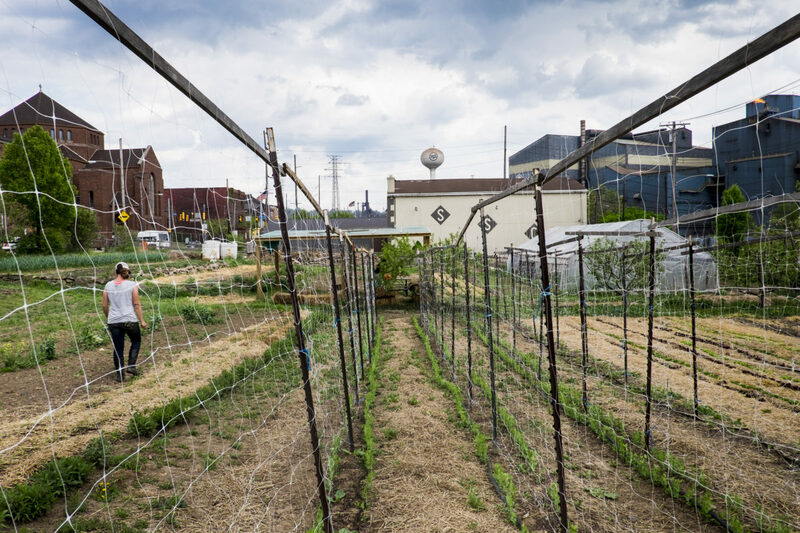 Braddock Gardens, a community garden sponsored by Grow Pittsburgh, sits against the backdrop of the Edgar Thomson Works in Braddock, Pa. The mission of Grow Pittsburgh is to teach people how to grow food and promote the benefits gardens bring to neighborhoods. Braddock Farms grows and sells a wide variety of vegetables and herbs to the local community. 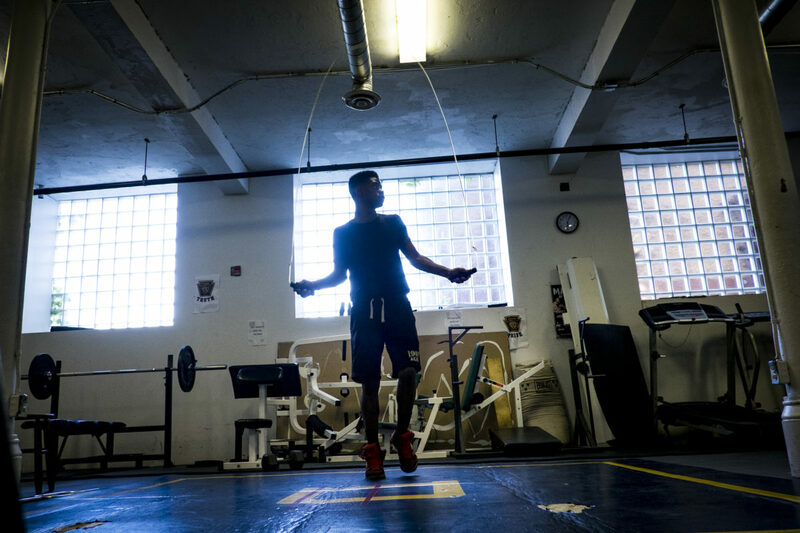 The Western Pennsylvania branch of the Police Athletic League runs a boxing program in the basement of the Braddock Community Center, which used to be a church. The program is free to everyone between the ages 8 and 18 and anyone currently attending high school. Its goal is to create relationships between volunteers and local kids, to help steer them away from crime, violence and drugs and be surrounded by positive influences. 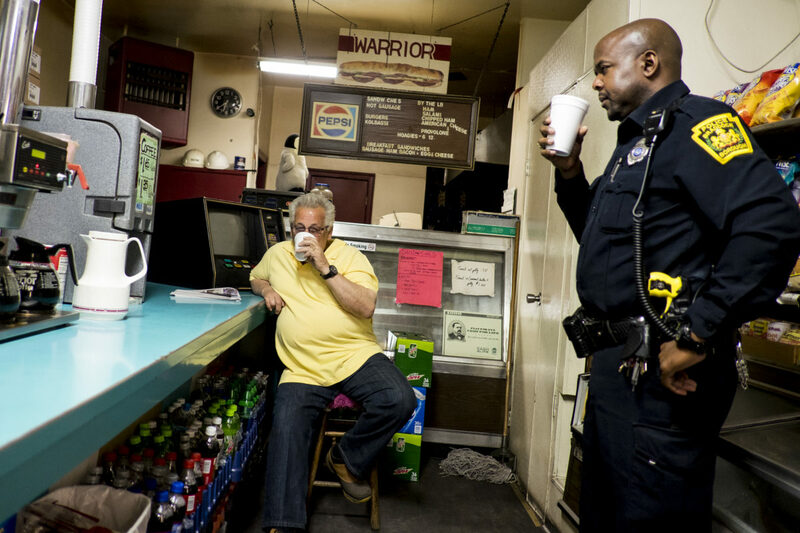 Local businessman John Sciarretti has morning coffee with a police officer in Al's Market in Braddock. Pa. Al'ss is a morning gathering spot for locals going to work and for steel workers on their way home. Very few of the workers at the Braddock mill actually live in the city. 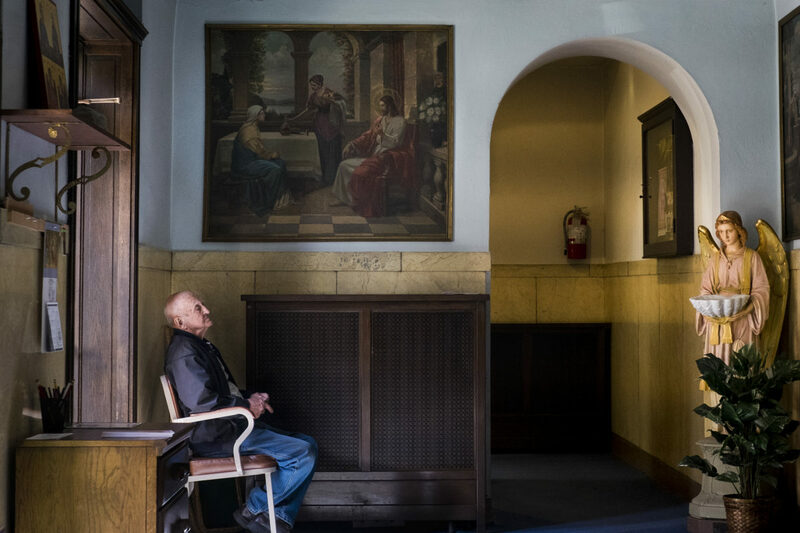 A parishioner sits in the entrance to the church during Sunday Service at Saints Peter and Paul Byzantine Catholic Church in Braddock, Pa.
Parishioners leave following Sunday Service at Saints Peter and Paul Byzantine Catholic Church in Braddock, Pa.
A patron crosses Braddock Avenue in the early morning hours after leaving Al's Market in Braddock. 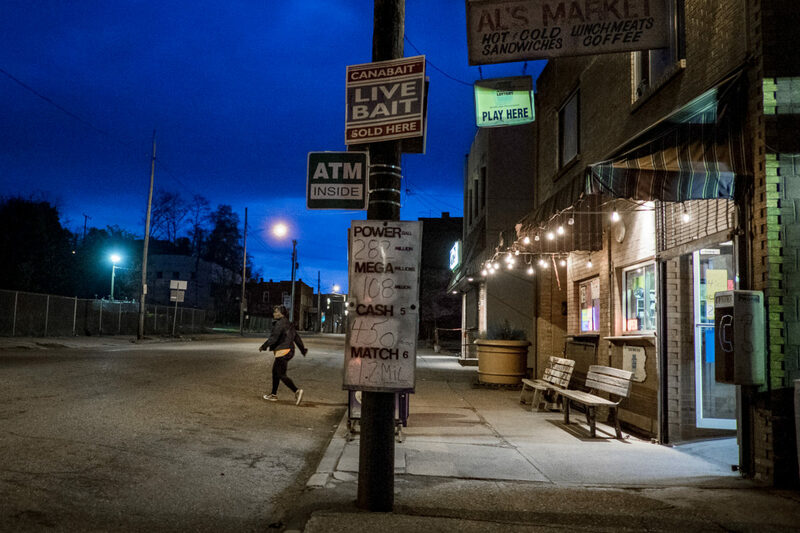 Pa. Al's is a morning gathering spot for locals going to work and for steel workers on their way home. Very few of the workers at the Braddock mill actually live in the city. 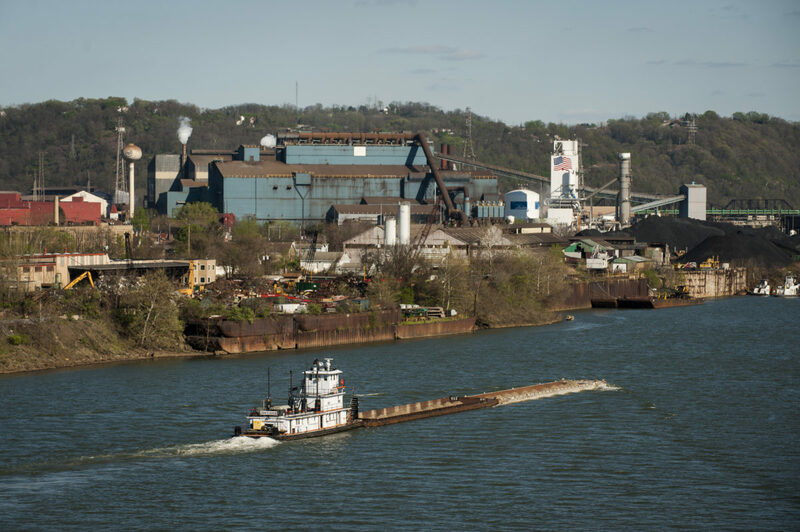 Braddock, a city in Allegheny County, Pa., along the Monongahela River, is home to the United States Steel Edgar Thompson Works. 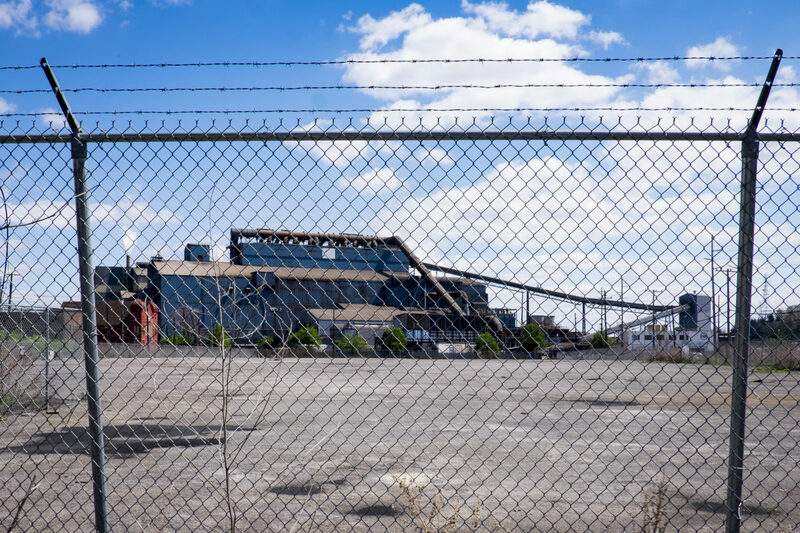 The city is one of many steel towns that is still trying to recover from the decline of the steel industry. 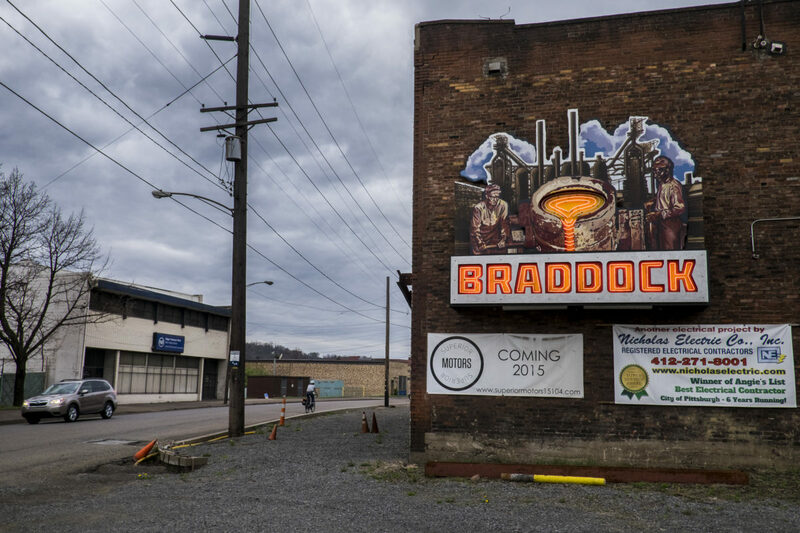 With a population of just over 2,000 (down from a high of 20,879 at the height of the steel industry, Braddock is almost a ghost town even though it is the home of the last steel mill still in operation in the Monongahela River valley. The Edgar Thompson Steel Works, built in 1872, was the first major steel mill built in the United States. Braddock was originally built to house the mill’s workers, but none of the mill’s nine hundred or so employees live there. The plant was Andrew Carnegie’s first steel mill and was named after J. Edgar Thomson, who was the president of the Pennsylvania Railroad. Today, two blast furnaces (Furnaces No. 1 and No. 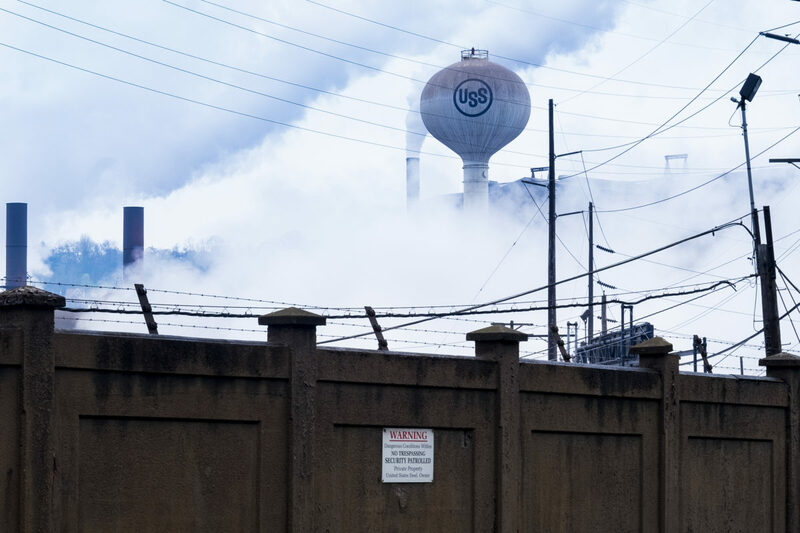 3) continue in operation at the Edgar Thomson Steel Works, which remains part of U.S. Steel. In 2005, the mill produced 2.8 million tons of steel, equal to 28% of U.S. Steel’s domestic production. The mill employs about 900 persons, some of whom belong to the second or third generations of their families to work in the mill. During the early 1900s many immigrants settled in Braddock, primarily from Croatia, Slovenia, and Hungary. Braddock lost its importance with the collapse of the steel industry in the United States in the 1970s and 1980s. This coincided with the crack cocaine epidemic of the early 1980s, and the combination of the two woes nearly destroyed the community. In 1988, Braddock was designated a financially distressed municipality. 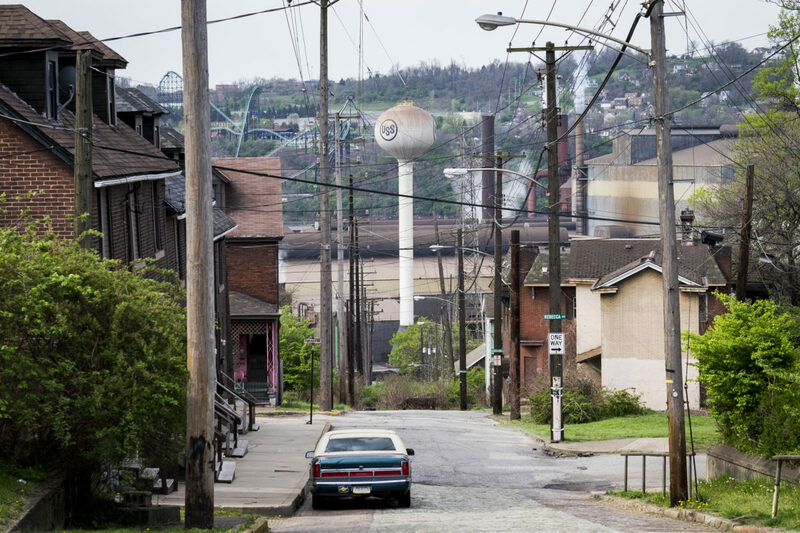 From its peak in the 1920s, Braddock has since lost 90% of its population. Click here to see more of this work in a larger project called Searching for Dream Street.